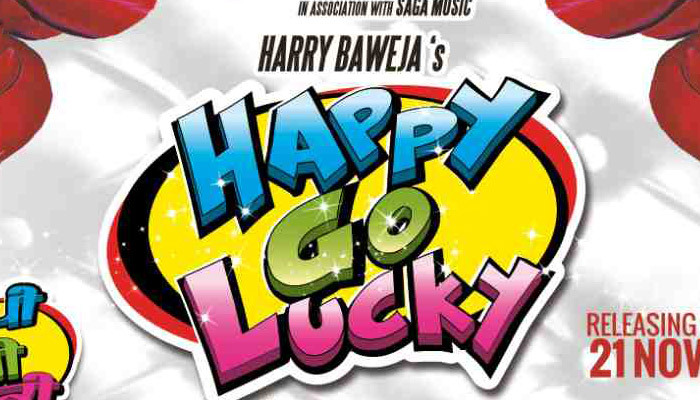 Baweja Movies Pvt Ltd in association with Saga Music presents the most entertaining Punjabi family movie of the festive season, Happy Go Lucky, releasing in cinemas on 21st November, distributed by B4U in the UK. Directed by Amarpreet GS Chhabra, Happy Go Lucky is a riotous, all-out entertainer for the holidays, presenting the bright young stars of Punjabi cinema, Amrinder Gill, Harish Verma, Sumeet Sandhu, Isha Rikhi, Shruti Sodhi and Dakshita Kumaria alongside industry stalwarts such as Gurpreet Ghuggi. The film is produced by Harry Baweja and Pammi Baweja under the Baweja Movies Pvt Ltd banner, which previously brought audiences Hindi Box Office smash hits such as Dilwale and Diljale, and the recent Punjabi animation film and already super hit, Chaar Sahibzaade. Music composers Jatinder Shah (Romeo Ranjha, Disco Singh, Jatt & Juliet 2, Jatt & Juliet, Carry on Jatta) and Jassi Katyal (Mundeyan ton Bachke Rahin, Mr & Mrs 420) have created a breezy soundtrack of anthems to complement the film. Bhalla, a millionaire, has three sons; Happy (Amrinder Gill), Go-ldy (Harish Verma) and Lucky (Sumeet Sandhu). One day, he happens to meet three sisters; Sirat (Isha Rikhi), Jas (Shruti Sodhi) and Mahek (Dakshita Kumaria) who he thinks are perfect matches for his sons, as their dream men match the profiles of his respective offspring – a cop, a singer and a NRI. Bhalla proposes the matches of his sons to the girls’ father, who insults him publicly for daring to suggest the alliance, Bhalla being an ex employee of his. A hurt and angry Bhalla tells his sons everything and insists they now marry the girls to avenge the insult. The boys agree, but by making sure the sisters fall in love with them for the individuals they are and not with the fantasy of their dream men. Only then will the boys marry them. How the boys now make the girls fall in love with them amidst the confusion caused by Hawaldar Harpal Singh (Gurpreet Ghuggi) and Dr. Preeto (Shivani Saini) and how the riotous journey of this romantic comedy reaches an action-packed climax forms the crux of this charming and irresistible story. Prepare for the most fun-filled and riotous Punjabi entertainer of the holidays, Happy Go Lucky, presented by Baweja Movies Pvt Ltd and Saga Music, distributed in the UK by B4U, releasing on 21st November.